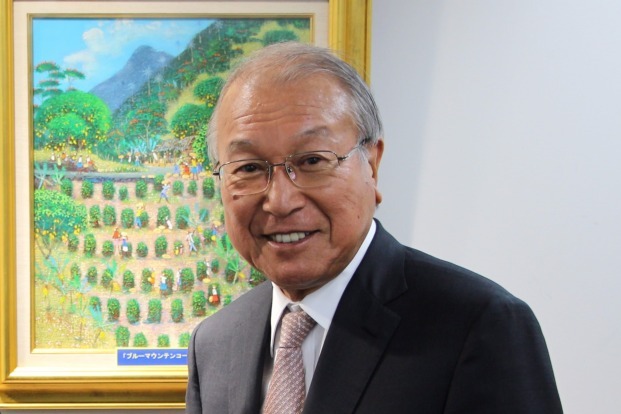 On October 11th, 2016, APIC intern Sayaka Matsuo held an interview with the Chairman and Executive Director of UCC and standing Honorary Consul of Kobe and Jamaica, Mr. Tatsuji Ueshima. Q. You have received the “Rainforest Alliance” certification; could you please talk about the process of receiving the certificate? Jamaica’s Blue Mountain Coffee is extremely popular and known as the best coffee in the world, and so in order to maintain a stable supply of coffee beans from the area to Japan, UCC established a coffee bean farm in the Blue Mountain area in 1981. Japan is Jamaica’s largest importer of coffee beans; however, other specialty coffees have emerged from other countries, increasing competition. In order to add value to the Blue Mountain brand and separate ourselves from the competition, we set our eyes on receiving the internationally recognized NPO Rainforest Alliance’s certification for our coffee bean farm. In order to receive the Rainforest Alliance certification, there are many requirements such as preserving forestry other than our farm, and ensuring the permanence of the farming business. For example, when using a tractor on the farm, because there is a chance that the fuel might leak onto the ground we have to cover the sides with concrete. However, the idea that we need to protect the environment has not taken root locally, so no one has taken steps to work on environmental maintenance. With this in mind we felt the need for the Rainforest Alliance certification, and UCC was the first to tackle problems surrounding environmental maintenance in the Caribbean region. We opened the farm hoping to build a bridge between the Japanese consumers and the local producers, while at the same time putting in a lot of effort to preserve the environment and improve working conditions. As a result, the local producers’ awareness of the need to protect the environment increased, and they started to feel a sense of emergency in improving the quality of coffee. Q. Could you please talk about some of your contributions to the local community? We hold environmental seminars, as well as financially support local schools’ events throughout the year, and also give out pencils to students. We put effort into having the local residents know that environmental preservation and higher quality in coffee will lead to a higher selling price. After the seminars we hold a social gathering and dinner as a way to deepen communication with everyone. Additionally, as part of our Corporate Social Responsibility (CSR) we are giving technique guidance to local workers. The guidance is to help keep a good level of food safety, and to prevent the use of pesticides when dealing with insect-related damage to crops. As for our educational support, not only do we provide monthly monetary support to schools, but we let the schools use our land for sports events as well. By engaging in these types of activities, local residents will come and help harvest the coffee farms during the busy season. With these kinds of exchanges, communication between the farm and locals deepens. We also support people with disabilities through our coffee by providing coffee to schools where the disabled make souvenirs. Q. What are some measures you have taken to ensure the quality of your coffee beans and to improve quality? Regarding quality management, the Jamaican government has an organization called the “Coffee Industry Board”, or CIB, which takes on the job of quality management and export procedures. We manage our beans based on the strict regulations set in place by the CIB. About quality improvement, with the cooperation of local residents, UCC has been holding a “quality contest” since 2015. Blue Mountain coffee is a specific area within Jamaica where coffee beans are grown. The quality contest is held between growers in this region only, specifically, the region is broken into five areas and farmers within each area form a group to produce their own special coffee bean. The beans are then judged according to their acidity, sweetness, and appearance on a number scale. The winners receive things such as fertilizer and farming equipment, and UCC imports the winning beans to Japan and sells them. This contest is not only held in Jamaica, but in other coffee-producing countries and regions such as Brazil, Hawaii, Ethiopia, Vietnam, etc. in aim to improve the quality of coffee beans, as well as to ensure a stable supply of quality coffee to the Japanese market. Additionally, I believe it is a good opportunity for the producers to understand the importance of producing quality coffee beans. Q. Could you please talk a little about your thoughts on Jamaica? I constantly feel the need to give back to Jamaica what it has given me. UCC is able to commercialize Blue Mountain coffee thanks to Jamaica, so I want to be of use to both Japan and Jamaica. In relation to this, I was very happy to hear that a certain Jamaican athlete chose the Japanese prefecture of Tottori as the location of their practice camp. I think it is a very good thing that Jamaica and Tottori can deepen their ties with events like this. I feel that these “grassroots” events are very important in helping strengthen the relationship between the two countries. In terms of giving back to Jamaica, UCC has done things such as created more employment opportunities at the farm and introduced new farming technology. Thanks to Blue Mountain, Jamaican coffee has spread and now become a luxury item in Japan, which I am very happy about. The amount of coffee consumed worldwide is currently on the rise. In order to keep up with the demand, it’s necessary to improve productivity; however, the Japanese eye for quality is very fine, so if the quality is not up to par then it won’t be sold. This is why we continue to improve the productivity while maintaining the steady quality of coffee that Japanese consumers expect. Q. As the Honorary Consul of Jamaica, could you please explain the exchanges and developments between Japan and Jamaica? One of our goals for the future is to use programs provided by the Ministry of Foreign Affairs to further develop Jamaican agriculture. Specifically, we are aiming for an improvement in productivity and an increase in consumption. Due to the destruction of the hurricane a few years ago, production amount of coffee beans is one-fourth of what it used to be during the height of production. However, if the productivity rate is high, then consumer rates will increase, creating profit for the local farms. Coffee bean trees produce less beans as they age, thus in order to maintain their production amounts, it’s necessary to trim them, or depending on the situation replace the old tree with a new one. However, Jamaica’s coffee plantations are located in the mountain ranges, where the latest technology is hard to reach. UCC is concerned about maintenance, and also strives to improve productivity while maintaining coffee bean quality. Additionally, I believe that it is a waste if we stop at only introducing simple technologies on the plantations. We do not want to just introduce the technologies, we also want the farmers to understand and realize that if they use the skills and knowledge they have, it can lead to the country’s development.